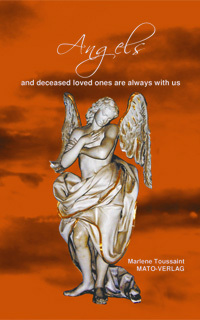 The book "Angels and deceased loved ones are always with us" serves to comfort those who have lost someone they deeply love and who was really close. All of us live and must die, but we are not dead. We continue to live on another level, on the level of light and love. Nothing can extinguish our immortal soul. moment of the deep mourning. There are so many ways of communication between heaven and earth that never will interrupt, as long as there are humans and love and as long as our world exists. This book is dedicated to my angel and to the people I love in the hereafter and in this world. Very open and personally, the author describes the experiences she had for many years "between heaven and earth" and simultaneously wants to encourage others to open themselves to the spiritual world. Through her deep believes in God and his powers, she is convinced that everyone who is ready can find a connection into the hereafter. One can also experience power and strength, if hate, sorrow and misery in our world let us doubt about sense and purpose of life.